Alchemilla Hospital (also known as Alchemilla General Hospital) is one of two medical centers in Silent Hill. 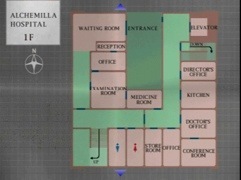 First introduced in 1999’s Silent Hill, Alchemilla has since figured into Silent Hill: Origins, Silent Hill: Homecoming and Silent Hill: Memories, as well as appearing in Silent Hill: Play Novel, although the designs of the hospital remained fairly similar, there have been some noticeable inclusions and exclusions in the layout of the building. 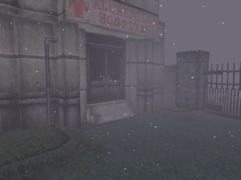 Alchemilla Hospital is presented as an emergency department in Silent Hill, Silent Hill: Origins​, Silent Hill: Homecoming and Silent Hill: Shattered Memories. The floor design remains relatively consistent throughout the series canon with variations occurring within Origins and Homecoming, including the introduction of an Operating Theater, presumably for instructional purposes, as well as relocating the store rooms that have been located near the restrooms across all three titles it appears in. However, it is possible that the real world Alchemilla Hospital has not changed since Silent Hill as Alex only dreamt of visiting it in Homecoming. Common to all games are multiple operating rooms, nurse stations, intensive care units, and public restrooms. Also plentiful are patient rooms, though what these rooms contain changes to fit each game. Unique to Silent Hill is access to all three floors of the hospital, a fourth floor in the Otherworld and the basement. 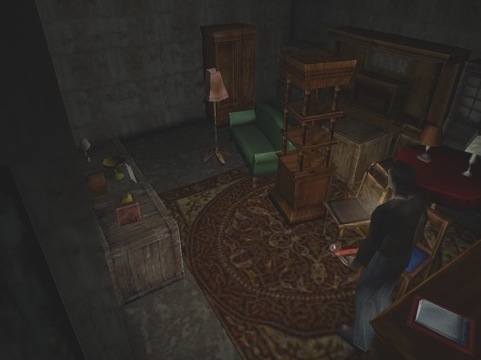 Within Silent Hill: Origins, access to the third floor and basement has been restricted due to maintenance and construction, while in Homecoming only the second and third floors are accessible. First introduced in Silent Hill, it was here that Alessa Gillespie was taken some time after her mother, Dahlia Gillespie, attempted to use her in a ritual by setting fire to their home, with Alessa still inside. Alessa was kept in a room deep inside of the hospital’s basement; all of the other nurses excluding Lisa Garland were told to never enter the basement. During his journey through the disturbing burg, Harry Mason, the protagonist of the game, makes his way here on the advice of Dahlia. Within, he meets Michael Kaufmann and Lisa Garland, two souls also trapped in the hell that has become Silent Hill. Andy’s Books is a bookstore located on Koontz Street in Silent Hill, in front of Alchemilla Hospital. It is featured in Silent Hill: Origins. Travis Grady takes a detour through it on his way to the Riverside Motel. The store basically consists of a single room, sectioned by a short counter. Within the cash register is the Bookstore Key, which Travis needs to open the back door. To open the register and get the key, he must type a three-digit combination (Andy’s room number from the Greenfield Apartments, as he is told by a memo nearby). The memo addresses Andy and is signed by ‘Dharma’. It’s made clear that Andy’s gone on vacation. Travis can get an Assault Rifle from the mannequin behind the register. It looks remarkably like a real-life AK-47. There’s also some ammo lying around the store. 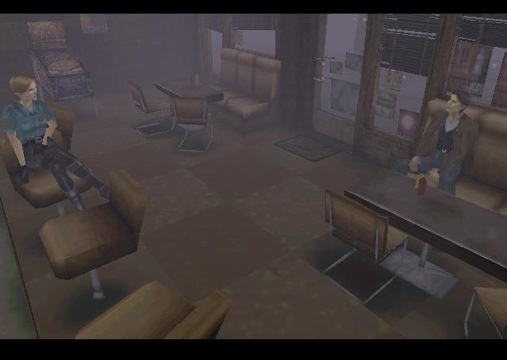 Annie’s Bar is a location in Silent Hill that Harry Mason is able to enter. 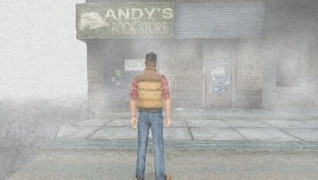 Outside Annie’s BarThe bar is found in the Silent Hill Resort Area, on the corner of Bachman Rd. and Craig St. The bar has a couple of billiard tables and other typical bar furnishings, but as with all other businesses it is deserted. Harry can find some supplies here, though the importance of the bar lies in an optional side-quest, which can determine what ending the player will receive at the end of the game. It also appears briefly in Silent Hill: Shattered Memories. Upon entering Annie’s Bar, Harry will find Michael Kaufmann being attacked by a Mumbler. Immediately, Harry rescues Kaufmann, and after a short discourse he leaves in a hurry. After Kaufmann exits, Harry finds a wallet he left behind containing a key to a nearby apartment, and a note with a code of numbers. After leaving Annie’s Bar, Harry can use the code to enter the Indian Runner store to the east. Inside Harry can find clues to enter the Norman’s Motel as well as a safe containing some of the White Claudia drug that has been circulating throughout the town. After entering the rear entrance of Norman’s Motel Harry will find a magnet, a motorcycle and more information about the White Claudia drug. The motorcycle needs to be started, and after using the magnet to obtain its key in Kaufmann’s motel room, Harry finds a vial of Aglaophotis hidden within the gas tank. Kaufmann quickly enters the scene, apparently angered at Harry’s meddling, confirming his involvement in the making of the Aglaophotis as well as the drug circulation. The above scenario must be completed in order to receive the Good or Good+ ending of the game. 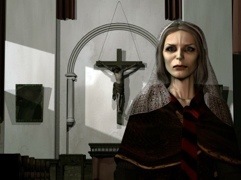 The Balkan Church is a church visited in the original Silent Hill game. It is located in Old Silent Hill on the corner of Bloch St. and Bachman Rd. Harry Mason first meets Dahlia Gillespie here following his journey in the Otherworld version of Midwich Elementary School. Harry is drawn to the church by its ringing bells, most likely rung by Dahlia. After leaving Harry with her explanation of what’s happening to the town (although further confusing him), Dahlia also entrusts Harry with the Flauros. Harry also finds the Drawbridge Key inside the church and is then able to enter Central Silent Hill. The Bridge Control Room is a building in Old Silent Hill that contains the controls for raising and lowering the bridge leading to Central Silent Hill. Harry Mason visits it in both Silent Hill and Silent Hill: Shattered Memories. After meeting Dahlia Gillespie in Balkan Church, Harry Mason finds the Flauros and the Drawbridge Key on the altar. He leaves the church and continues down Bloch St. toward the Bridge Control Room. If the game is in Next Fear mode, he may stop at the Hell Station to pick up the gas can, which he can use to get the Chainsaw or Rock Drill. The Rock Drill is located on the first level of the Bridge Control Room. The second level contains the controls. He must use the Drawbridge Key to access the control panel and lower the bridge, so that he can continue to Central Silent Hill. 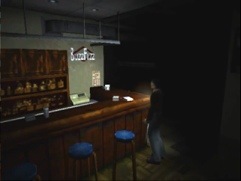 Cafe 5to2 is a small diner located on the north side of Old Silent Hill on Bachman Street. It features predominantly in the original Silent Hill game. Near the beginning, after being attacked by the Otherworld’s monsters, Harry Mason wakes up here, presumably saved by officer Cybil Bennett. It is also here that Harry receives his first weapons, the knife and the handgun, as well as the series trademark radio and flashlight. A few health drinks and a save point linger about; there’s ammo for the handgun outside on a bench. Despite Cybil’s suggestion to remain safe and indoors, Harry attempts to leave the cafe to search for Cheryl Mason. However, as soon as he does the radio begins to emit the ubiquitous static, and he is subsequently attacked by an Air Screamer. Green Lion Antiques is Dahlia Gillespie’s antique store located in the northeastern corner of Central Silent Hill, and a location visited by Harry Mason in the original Silent Hill. Harry goes into the store following his experience in the Otherworld version of Alchemilla Hospital. He does so after Dahlia Gillespie’s advice, using the Antique Shop Key she leaves behind.Inside the store are various furnishings, some appearing to be of value. The importance of the store lies in a secret tunnel found in the back wall. The tunnel leads to a small room that has been arranged as a small altar. This altar appears to have been in use by the town’s secret cult. After visiting the small shrine Harry is then taken by surprise and transported yet again to the Otherworld version of Silent Hill. The Happy Carousel is an attraction featured in Lakeside Amusement Park, on the Resort Area of Silent Hill. 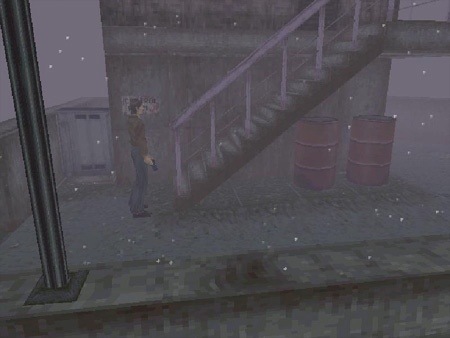 It shows up in Silent Hill, the Silent Hill: Play Novel remake, and its direct sequel Silent Hill 3, always serving as a battleground for a major boss fight. All incarnations are similar: a functional, spinning carousel with horses for rides, always visited near the end of the game within the town’s Otherworld. Harry Mason follows Cybil Bennett into the park and finds her passed out on a wheelchair atop the carousel. She wakes up, possessed, and attacks Harry as the carousel begins to spin. If Harry has previously collected the Aglaophotis from the Alchemilla Hospital, he can use it on Cybil to expel the parasite from her and save her life. Otherwise, he must fight Cybil and eventually kill her. The game’s ending partly depends on her fate. 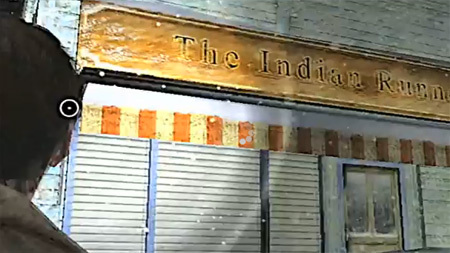 The Indian Runner is a store in the Resort Area of Silent Hill. 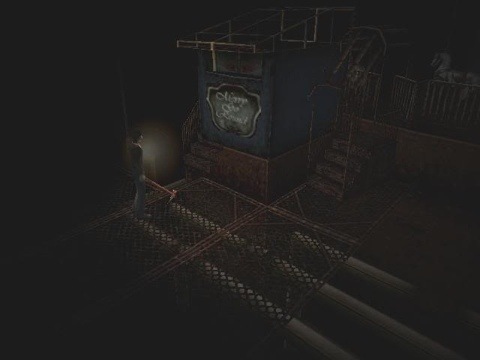 Harry Mason enters the store in the original Silent Hill. It is located on the corner of Craig St. and Weaver St., and appears to be a small general store. The entrance to the store is locked, and Harry must solve the combination lock with a code before being able to enter. Amongst the supplies found inside are clues and important items pertaining to the optional Kaufmann Sidequest that can determine the ending of the game. Deliver to back door daily 8 a.m. The code at the end can be used to enter the rear entrance of the motel. Along with the note Harry can find the key to a safe within the store containing some of the White Claudia drug that has been circulating throughout the town. After entering the rear entrance of Norman’s Motel Harry will find a magnet, a motorcycle and more information about the White Claudia drug. The motorcycle needs to be started, and after using the magnet to obtain its key in Kaufmann’s motel room, Harry finds a vial of Aglaophotis hidden within the gas tank. Kaufmann quickly enters the scene, apparently angered at Harry’s meddling, confirming his involvement in the making of the Aglaophotis as well as the drug circulation. The above scenario must be completed in order to receive the Good+ ending or the Good ending of the game. 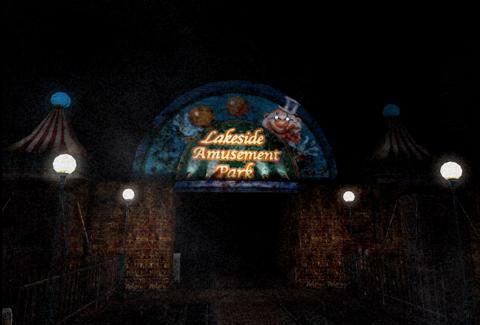 Lakeside Amusement Park is an amusement park in Silent Hill. Located in theResort Area, it’s a popular tourist attraction with key activities including a rollercoaster, a carousel, a ferris wheel, and a few other carnival rides and sideshows. Midwich Elementary School is a school located on the south-west side of Old Silent Hill, on Midwich Street. Alessa Gillespie was a student there, and it is an important location in the first Silent Hill game. Midwich Elementary School was also featured in the film and comic series. 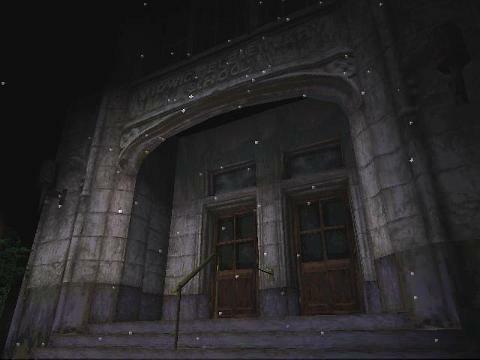 In the original Silent Hill, the school plays as the first major building in Silent Hillthat Harry Mason explores, in a bid to find his adopted daughter, Cheryl Mason, who left clues to her next possible location in the form of scrawls from her colouring book. During Harry’s visit to the school, he encounters the Grey Children (or Mumblersin the PAL and NTSC-J version), as well as an assortment of various riddles and puzzles that will ultimately lead him to the Otherworld version of the school. Midwich Elementary is the first building Harry visits that undergoes a complete Otherworld transition, though this is done during Harry’s travels through the clock tower, so the transition itself is subsequently unseen.